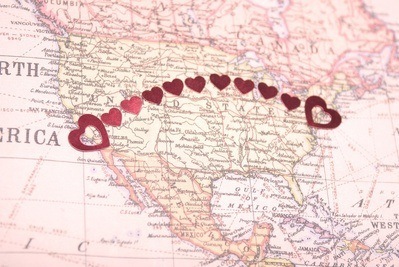 » Do Long Distance Relationships Work? Our experience with friends and family may tell us otherwise, but long distance relationships can and do work, according to recent research in the Journal of Communication (Jiang & Hancock, 2013) discussed in the Huffington Post. The study took note of the ever increasing number of couples involved in long distance relationships brought on by the demands of educational pursuits, career development, or emigration. Couples Therapy Inc. regularly works with many international couples that meet this description. Advances in communication technology is a factor helping couples stay passionately engaged and emotionally connected. The study comprised over 60 couples: some who were already in long distance relationships, and others who were regularly in close physical proximity. Long distance couples in the study were highly trusting, and had greater feelings of staying connected on a regular basis with their overseas partners, despite the separation. Critics of the study, however, remind us that separation from a beloved partner is not desirable, but the research shows that resilient couples do adjust their behavior to nurture their intimacy. Do long-distance relationships work? There has been additional research on long-distance couples. They tend to talk with each other less frequently but, what they do say is more intimate and self-disclosing. Apparently, this intimacy emphasis seeks to compensate for the lack of physical proximity. Online couples therapy is often prized by long-distance international couples to work through issues and to nurture a vibrant intimacy while separated by vast distances. Ultimately, this research suggests that couples in long distance relationships can, and often have, similar levels of marital harmony and connection as those who are geographically close to each other. While the key factor is that the relationship must be in overall good shape, it is useful to know that separation by itself, does not have a toxic effect on couples.Do Long-Distance relationships Work? Interestingly enough, some research shows that long-distance couples may actually be happier with the quality of their conversation than couples who see each other on a regular basis. How do long-distance relationships work? These couples don’t engage in idle chit chat. They talk about their feelings. They know that they can’t physically touch, so they reach out emotionally. Have a long-distance stress-reducing conversation. Talk about what impacted you today, and how you felt about it. One of the challenges in a long distance relationship is that different time zones and skew your understanding of each others schedule. Compare notes beforehand. When is the best time to connect? Do you prefer video conferencing most of the time, or will social media work too? Remember you want a predictable pattern of contact that works for both of you. In general, research shows that long-distance relationships are more satisfying and less stressful when there’s a plan to be together at some point. You might have a different tolerance for being separated, and these differences may create tension. Talk about those differences in an open and vulnerable way. Some partners refrain from making friends or having new experiences because they resent their need to be away from their beloved. Don’t make that mistake. Live your life, go places. Have experiences, and share them with your partner. Long distance means you lose track of how your partner is moving through time in ordinary ways. What are they reading? Watching on HBO? What mew foods have they tried recently? Maybe you could watch something, or read something together and talk about it. It’s the vivid ordinary details that convey a sense of time and place. Don’t overlook something about your life because you fear it is boring. if you have a reaction to something, it’s worth talking about. No doubt that you’ll stay connected through Zoom or Facetime and social media. But mall gifts and thoughtful gestures can convey powerful emotions too. if you visit someplace you’ve never been before, send a postcard or a small souvenir. Small tokens can be large reminders of your powerful emotional connection. Gottman says “small things often.” This can apply to small gifts and tokens as well. If you plan to visit one another don’t over plan your stay with too many activities. Time may seem precious, but remember the mere fact that you are both enjoying the novelty of being together will slow down your sense of time. You will learn a lot about yourself when you are away from your significant other. You will look back and see how deeply attached you were, and how absence made your heart grow fonder. Given the opportunity to deepen your connection, it may be wise for you to pretend that you are looking back on this time from some point in the future. What did you learn about yourself? Your partner? How did being apart deepen your connection? Reframe the experience as an opportunity for growth, and not just a difficult experience at the present moment. Are you Connecting or Inspecting? Let’s face it. The biggest issue with long-distance relationships is the fear of being cheated on. Trust is a Must. Trust never sleeps. It’s ok to have some anxiety but make sure you’re both on the same page. Don’t look for trouble by giving your partner an interrogation. They have a life to live, and they aren’t going to live like a monk just to reassure you. Make sure you give trust and deserve trust in return.